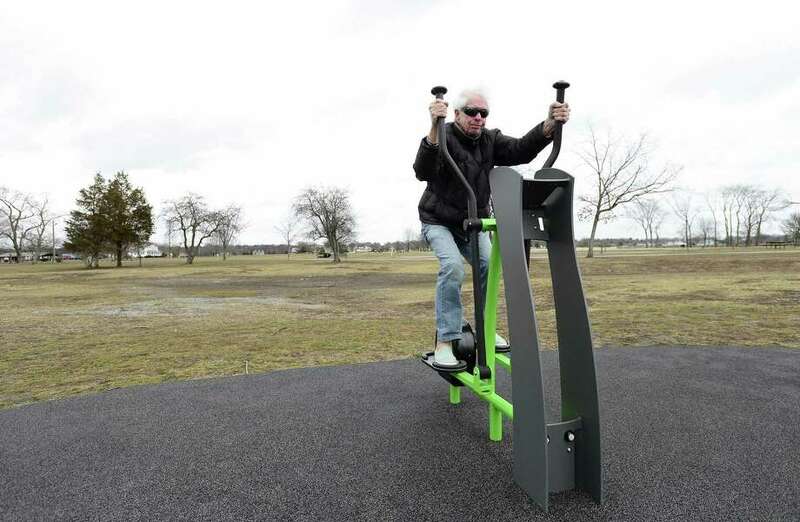 Peter Moss of Darien uses The Cove Island Fit Zone to exercise on March 13 in Stamford. Moss visits the Stamford park daily to walk and exercise. A family-owned lumber, building supply and home improvement company is sponsoring a museum exhibit, which gives children the opportunity to use real tools and real materials to create. Thanks in part to a generous donation by Darien-based Ring’s End Inc., children are tinkering, creating and making at Norwalk’s Stepping Stones Museum for Children. The wildly-popular Mega Making exhibit returned to the museum in September, blending learning and play in a unique, hands-on manner that celebrates the creativity in children. Featured at Stepping Stones during the summer months in 2015 and 2016, the expanded, new-and-improved Mega Making experience is being hosted until Labor Day during this stint at the museum to allow school groups to put their students’ building and making skills to the test during school visits. In addition to the support provided by the primary sponsor, Ring’s End, the Mega Making exhibition was also made possible by the generosity of supporting sponsor First County Bank. Darien High School graduates Colleen Heaney, Thomas Kreuch and Molly Klein earned this honor, as did Darien natives Grant Morro and William Halloran, a graduate of Rye Country Day School. Heaney, a member of the class of 2018, is majoring in religion; Kreuch, a member of the class of 2021, is majoring in humanities; Klein, a member of the class of 2020, is majoring in environmental studies; Morro, a member of the class of 2018, is majoring in music; and Halloran, a member of the class of 2019, is majoring in mathematical economics. The Cohen Foundation has been a longstanding and generous supporter of P2P, providing funding for the agency’s 2013 expansion into Norwalk, underwriting the purchase of a new box truck in 2016 and now making this grant for the Mobile Food Pantry. There is a high rate of food insecurity in Stamford and “P2P on Wheels” will give residents the opportunity to select free grocery items, including fresh produce, dairy items, meat and poultry, and canned goods. P2P will be able to serve more residents of the city than they can currently accommodate in their Darien office, up to 40 additional families daily, with casework counseling and emergency financial assistance. This also increase their collaboration with partner agencies in Stamford, at which the Mobile Food Pantry will be stationed during the week. Established in 1968 to provide low-income individuals and families living in Lower Fairfield County with basic emergency services, P2P’s service area includes Darien, New Canaan, Norwalk, Stamford, Weston, Westport and Wilton. Gather your Easter baskets and come out for an Easter egg hunt on the front lawn of the Darien Community Association March 30. This annual event starts at 10 a.m. and takes only a few minutes. The Easter Bunny is expected to make a special appearance. Parking at the DCA is limited, so carpooling is encouraged. In the event of inclement weather, a cancellation of the egg hunt will be announced on the DCA website, through an e-blast, and in a voicemail greeting that morning. Special price of $20 cash per car; reservations are not required. The hunt will be held at the DCA, at 274 Middlesex Road in Darien, weather permitting. For more information, contact the DCA at info@dariendca.org or 203-655-9050, ext. 10. The Impact Vine is an online giving platform that allows donors to support projects they are passionate about, and local nonprofits to raise funds for socially-impactful projects in the community. DAC Stage — the DAC’s community theater group — in collaboration with The Lipstick Project — an all-female acting troupe from Darien and surrounding towns — is producing the first all-female cast of Kander and Ebb’s musical. The show will open April 27 and run three weekends at the Darien Arts Center’s Weatherstone Studio. The DAC is a unique visual and performing arts school with a community theater program that must rely on fundraising, as tuition and ticket sales do not cover yearly operating expenses. In striving to keep members of the community engaged and entertained, this production of “Cabaret” will employ six musicians, a sound technician and a choreographer, while engaging a cast and crew of over 40 volunteers. Potential audience numbers may reach upwards of 800 people. All supporters investing $150 or more will be given a complimentary ticket to their performance of choice and will be acknowledged on the DAC website. Donators investing $250 or more will be given two complimentary tickets and will be acknowledged both on the website and in the show program. Donators investing $500 or more will be given four tickets, will be acknowledged on the website and in the show program, and will be serenaded by a cast member at their VIP prepared table. To support the DAC’s all-female production of “Cabaret,” please visit, theimpactvine.org. For tickets to the show, go to darienarts.org. The Darien Arts Center is located at 2 Renshaw Road, behind the Darien town Hall. For questions, call 203-655-8683. The fifth annual gala benefit is March 24 from 6 to 11 p.m. at Rolling Hills Country Club in Wilton. The event showcases seven Fairfield County business representatives, each paired with an award-winning dance professional from Norwalk’s Fred Astaire Dance Studio, who donate their time to practice routines, hone them to perfection and compete in the event. The “Dancing with the Stars” gala benefit is ElderHouse’s largest annual fundraising event and helps the Norwalk nonprofit sustain its program of adult care, socialization, and recreational activities to a senior population living with aging diseases. Funds will be raised through ticket sales, pledges, onsite voting, live auction and a paddle raise. For information on how to donate, make a pledge to a favorite dancer or for event tickets, contact ElderHouse at 203-847-1998 or elderhouse.org/events.